HTML5 Tabbed Panels is distributed as an Adobe Dreamweaver extension, packed as a file, named JQTabbedPanels.mxp. Read more in the online help. 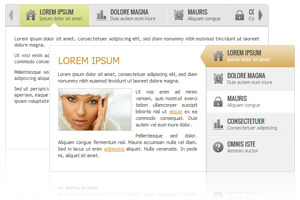 HTML5 Tabbed Panels is a very easy and convenient way to organize your content in the most effective way. Tabbed Panels can imitate the multi-page structure and as a result, your site visitors will get easy access to the big content without scrolling through a large page. More over component has auto height function, which is very useful for content of different height, as panel container will be automatically resized when user click the tab. HTML5 Tabbed Panels comes with a wide range of settings for customization. Tabbed Panels options lets you configure the position of the tabs making possible to organize either horizontal or vertical design. Additionally you can choose whether you want to display tabs in a form of scrolling tabs panel or make them look like bookmarks. Autoplay and loop functions give you the ability to turn component into a kind of scroller, or even banner as it will rotate the content in a form of carousel. Tabs icons and subtitles offer your site visitors more vivid and diverse tabs look. 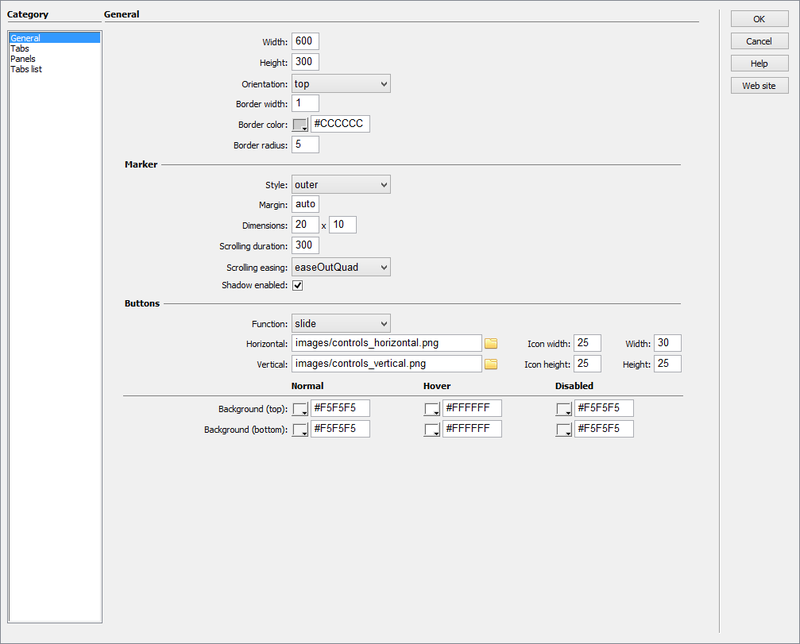 You can choose from multiple animation settings and easing effects for the tabs scroll, panel swap and height resize. Tabbed Panels has nice feature of loading panel content using AJAX to save page load time as site visitors will not always navigate through all the tabs. All that you need to do is to add a link of the external file with the content to a tab. And don't forget that HTML5 Tabbed Panels is search engine friendly as content is situated inside structurally semantic HTML code and can be easily accessed and indexed by search engines. The installation package contains Dreamweaver extension, providing you the ability to easily create tabbed panels, all in Dreamweaver CS3, CS4, CS5, CS6, CC 2014, 2015, 2017 and CC 2018. Using the user-friendly interface, you are provided absolute control of all colors, fonts, sizes, spacing, etc. You can easily create necessary list of tabs, using tabs editor. Through the tab editor you can add or remove tabs, write description or move them. Tabs can display any HTML code. The tabs can be placed horizontally (above or below) or vertically (left or right) of the content. Tabbed Panels has control buttons, this makes it possible to display any number of tabs. Users can navigate through the tabs using these buttons or swiping if using a touchscreen. Tabbed Panels can automatically scroll through the tabs in a loop. Using these options you can turn component into scroller. Panels can contain various content with differnt height. You can enable the auto height setting, so panel will be automatically resized according necessary height. Component has different animation and easing effects for tabs scroll and panel swap. Each tab can have its own icon with alignment parameter. Each tab can have its own title and subtitle with alignment parameter. Installation package contains Dreamweaver extension. 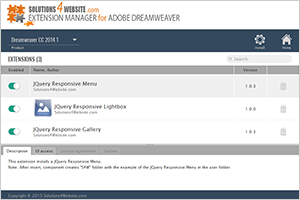 Dreamweaver extension allows you to easily create HTML5 Tabbed Panels. Extension has user friendly interface.